My two previous posts have been about the ancient landscape of Britain. I have discussed the preeminence of water and all the pervasiveness of the forests which were the dominant features of ancient Britain. Modern Britain is very different. Our country is criss-crossed with good roads, we need not fear ambush from lawless bandits, we do not have to stick to the high ground to avoid swamps and the unhealthy atmosphere. This often makes it hard to really understand why our ancestors built where they did. Baginton in Warwickshire is a strange, lovely little place out of the way and overshadowed by Coventry. Not the kind of place where you would normally expect to find a Roman fort. The Romans were pro-active with their defensive strategies so building the fort in such a nice place means that at sometime in the past Bagington must have been a more, robust, place to live. But there is much more to Baginton that first meets the eye. Just down the road and across the river from the fort are the remains of two prehistoric barrows – somebody having approved planning permission to drive a bypass through them kind of ruined the archaeology – on the other side of the river is the remains of a small fortified manor house, then a quarry made into a lovely garden, then the remains of Baginton Hall which was burned down in the late 19th century, a series of medieval fish pools around which the fields bear the imprint of the medieval serfs who toiled on the land. So clearly there is something about Baginton, some unseen factor that makes it important in so many different ages. I think that the position of the fort can be best explained by the Coventry road which runs through Baginton, it seems to be an very ancient road elevated over the landscape following the contours until it dips down to a bridge over the Sow and then onto Coventry. This makes the fort extremely important strategically. It was constructed in the years following Boudican revolt when Agricola was engaged in measures to reduce the forces of the Britons. Lunt fits into this strategy of reduction as it controls the Coventry road, the crossing of the Sow and a major route in and out of the Forest of Arden. From this position the Romans were able to bring up resources and supplies, prevent resupplies to the celts holding out in the forest whilst at the same time providing a safe retreat for soldiers policing the forest seeking the fugitives. At the fort we have a fantastic model of the site in the sixty first decade which features a group of Roman soldiers bringing prisoners into the fort… to assist the Romans with their enquires which I speculate was a regular occurance during the sites twenty year life span. This is of course speculation. It might be based on observation, the use of my powerful intellect (ha) and reflective conversations with my colleagues but the thought processes, the strategic considerations and the planing that led to the fort being built at Baginton has been lost in the mist of time. 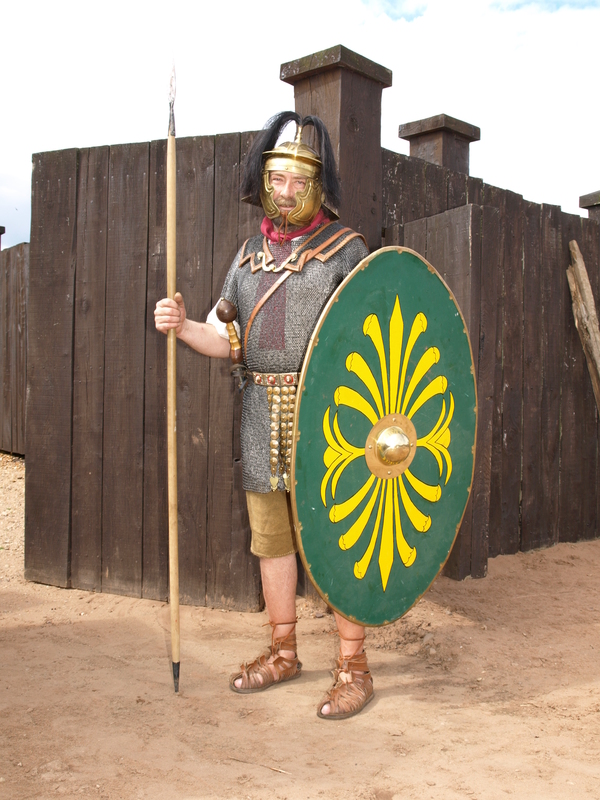 By the time of the Dacian war all of the soldiers who had been based at the Lunt, who had survived his service, would have retired and soon be coming to the end of their lives and as they passed certain knowledge of the Lunt passed away with them. A SOLDIER BRINGS A PRISONER TO THE EMPEROR FOR QUESTIONING. NEAR HIM WE CAN SEE MUSICIANS WITH THEIR TRUMPETS AND A STANDARD BEARER. THEY ALL WEAR ANIMAL SKINS ON THEIR HEADS. 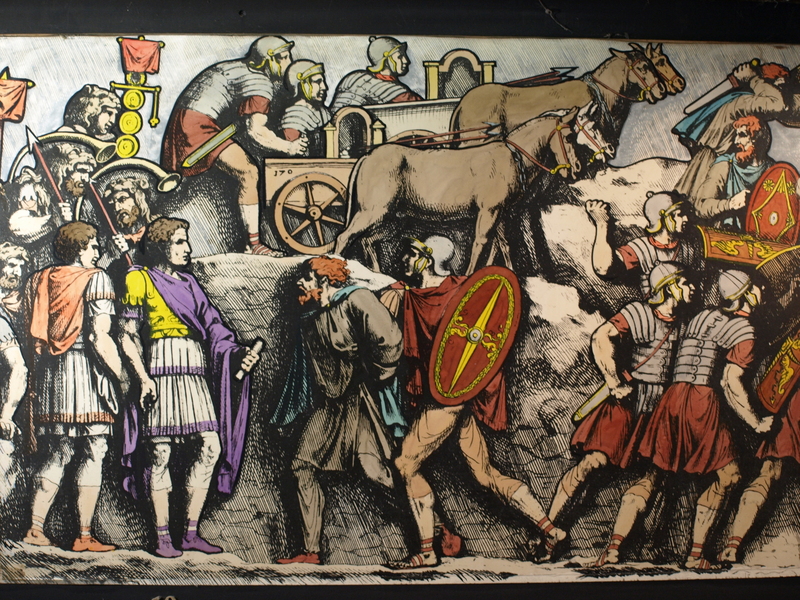 BEHIND THIS WE CAN SEE CATAPULTS (BALLISTAE) IN SMALL CARTS DRAWN BY MULES. The cart (or chariot) mounted “scorpion” (similar to the working re-construction at the Fort) was known as a “Carroballista”. 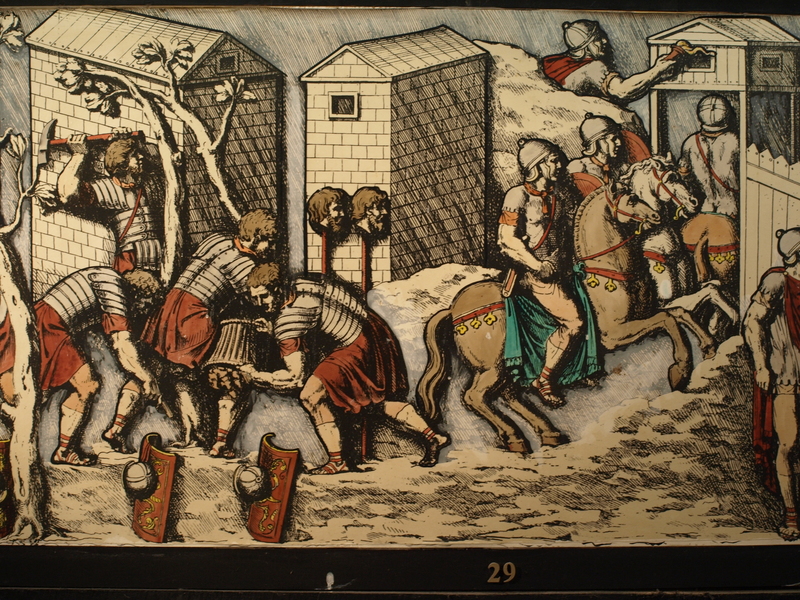 Each would be crewed by a contubernium of eight men, (represented here by just two soldiers), and drawn by two mules. 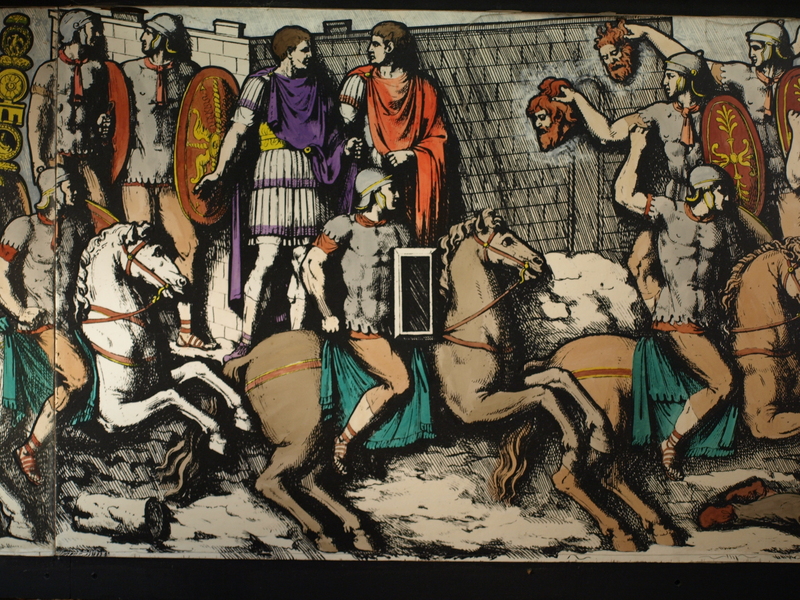 Some versions were bigger, carrying larger catapults, on four-wheeled carts, drawn by armoured horses. The tantalising question here is – how were they used? Were they simply being transported to a theatre of operations in this manner? Or were they used in a tactical sense? In other words, were they directed to different positions in the course of a battle as need arose. If used in this way – and the images on the Column clearly indicate the crews manning their machines on the move – then we are witnessing the use of Flying Artillery, sixteen centuries before its “introduction” by Gustavus Adolphus of Sweden. It is shown here providing flanking fire to support an advance by the Legionary infantry. Does anyone know of any detailed reference to this fascinating weapon in ancient sources? The Carroballista appears several times on the Column. Caesar never mentions it. Neither does Josephus. I wonder if it was first used in the Dacian War?